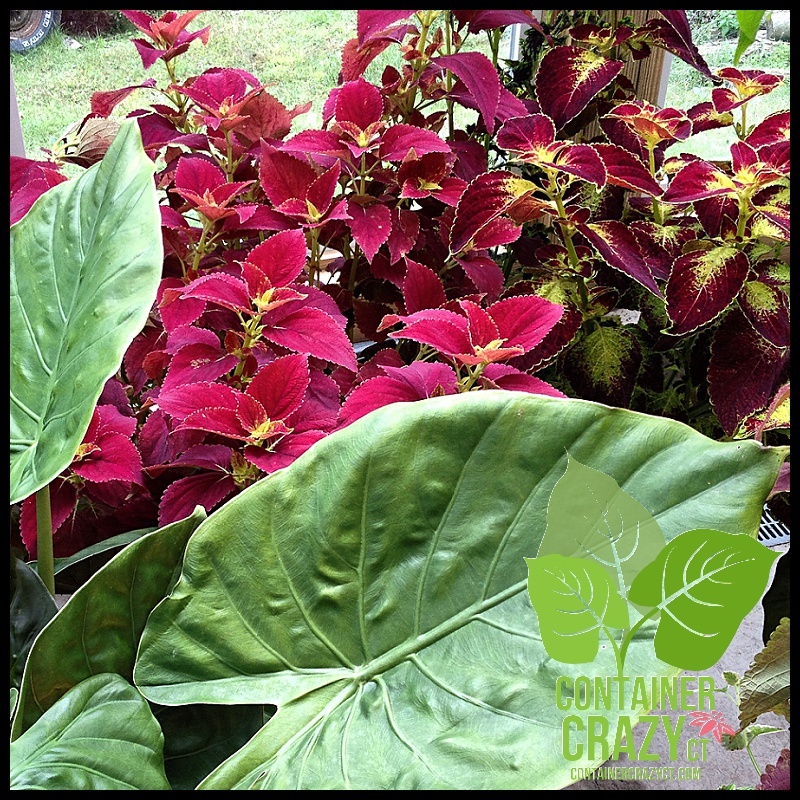 What Should I Do with My Container Gardens and Patio Pots right now? You – like me – probably thought you better move in some of your deck pots as a result of the gusty winds and cooler temperatures hitting us right now. Well, long story short – It was a blessing they happened to be free at that very moment for about 30-40 minutes. They came right over. I quickly got my garden gloves on and moved some debris from an ornamental grass I had left lying on the ground in the way. 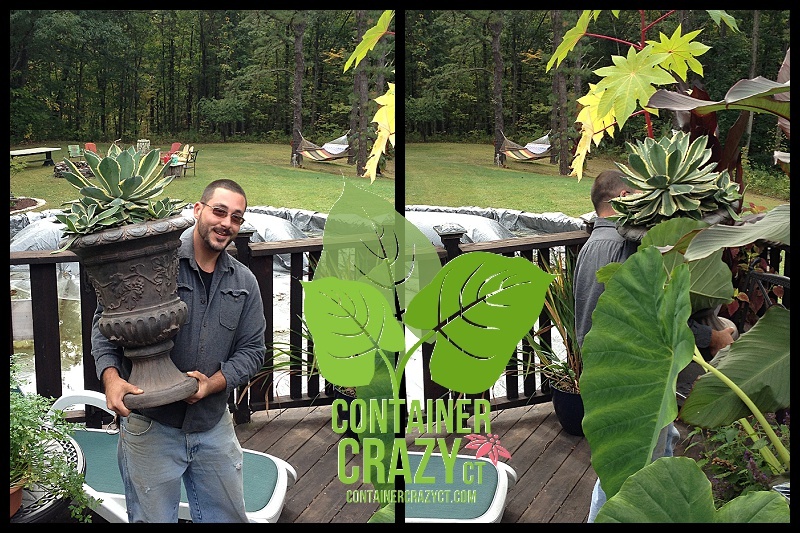 As soon as they arrived, Ross and Joe started picking up some of the medium sized pots in their arms and walked them to an indoor location for me. I was washed over with relief as I watched them walk down my deck stairs with the pots hovering over the shoulders and my big plants bobbin’ over their heads. When showing Ross one of my prized plants – I pointed out a stem while indicating it is easily damaged. “I really don’t want it to break,” I said. He was super careful. “Don’t drop the pots hard when you put them down – This can cause the pot to crack especially for pots that are thinner resin pots.” Another statement I was saying quickly because these two young guys were moving fast. Ross asked several questions along the way. “Wow, what is this purple plant?” he asked. “That is Persian Shield, and it is called, Strobilanthes,” I replied. 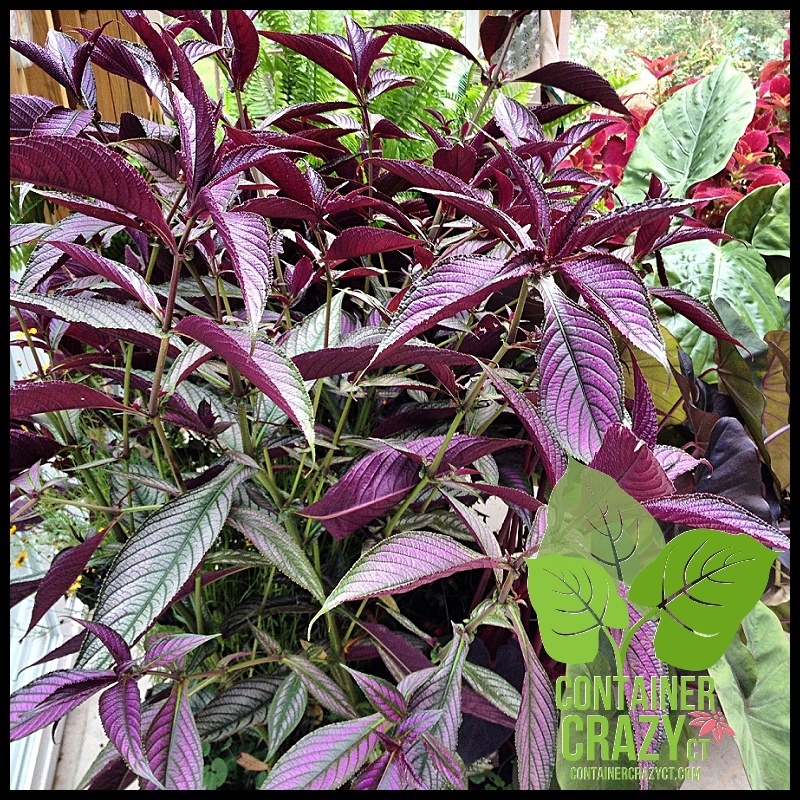 Strobilanthes (Persian Shield) is a purple plant – the color is fading due to cooler temps. Ross then started taking photos with his phone before he picked up the next pot. 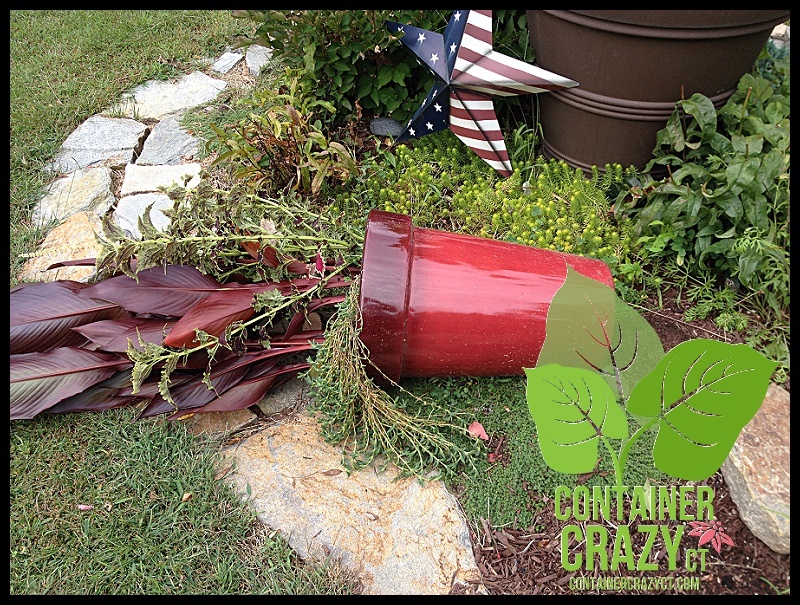 Tall pot toppled over already from gusty winds. After all was moved into an enclosed growing space or onto my driveway for ease of taking them apart later, the guys wanted to pose by my big red banana plant in the backyard. This plant will be part of my overwintering demo in two weeks (and may be published in a catalog. More on that later.). 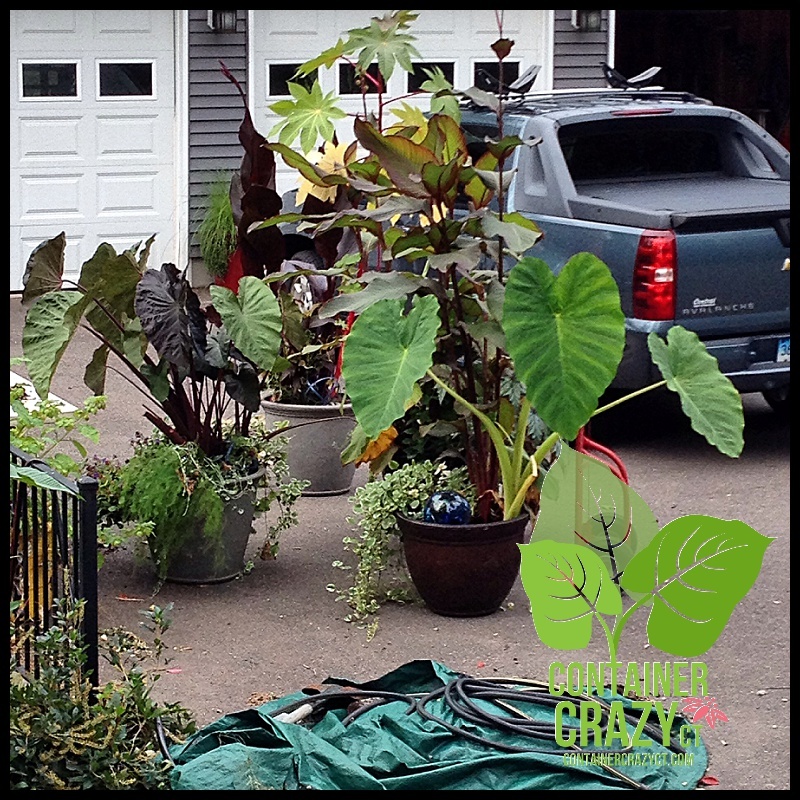 Some of your tropical plants in container gardens and patio pots (banana plants, Canna, elephant ears) are still safe out there however. The temperatures are in the 40’s to 50’s degree range, and with the 30-35 mile hour winds, it will feel like we are hovering in the mid to lower 50’s. It will feel cold but we are not getting frost. The gusty winds will tear leaves of big banana plants probably and the cooler temps will make some of the leaves start to turn yellow. Plus, all the cold rain will cause dampness around your plants. This will make your pots heavier as the soil gets soaked. Some of your tall pots may fall over from the winds. My tall red pots with towering Canna plants already did – so if you are concerned with breakage of pots or plants, move those to a sheltered location. 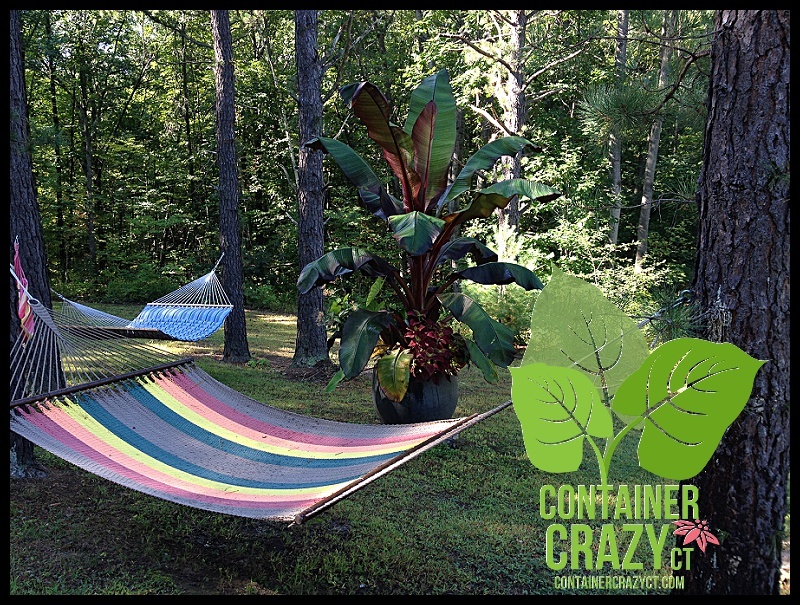 Even though, I am offering a session on October 17th to demonstrate how I store the root bases of red banana plants, and how to store Canna rhizomes and elephant ear corms (bulbs), I’m shooting off some tips right now quickly. Get help – if possible. The best part of my 3 amigo’s spontaneously helping me yesterday is they refused payment when they were done. I almost cried. I suggested some cocktail treats – and they responded with, “Yah, let’s go to Broad Brook Brewery soon.” If you can’t get help, use a handtruck to move heavy pots – and take your time. Try not to rush, bend those knees, etc. If a friend is helping you, please remind them to be careful to not rush – this results in hurting your back or straining something when moving heavy pots. Coleus ‘Dipt in Wine’ is stunning still, taking cuttings of the tips with stem and leaves will save them if you don’t have a growing location inside. 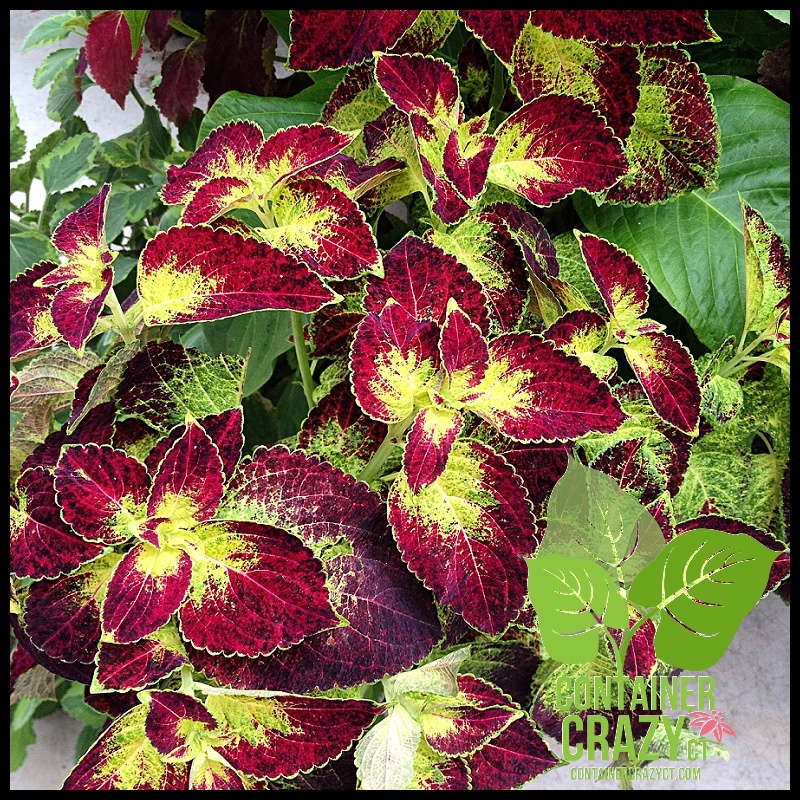 Coleus – If you have some in pots, take some tip cuttings and put in water in a cup or vase. This is a way to save a bit of the plant. It will root eventually and you may pot it up in a small house plant pot to keep over the winter. Agave in Urn – Watch those spines by your head, Joe!! For succulents – as I have said in the past, move them inside the house. They will get wet now for sure – and it can rot the tender foliage because the temperatures have dropped down. Get them inside the warmth by a window and let the soil dry out. By garage, will be taken apart this month at my session. Move your big pots into a garage if you don’t have time to tend to them right now. They won’t get totally soaked by the rain if you plan to dissemble them later this month. 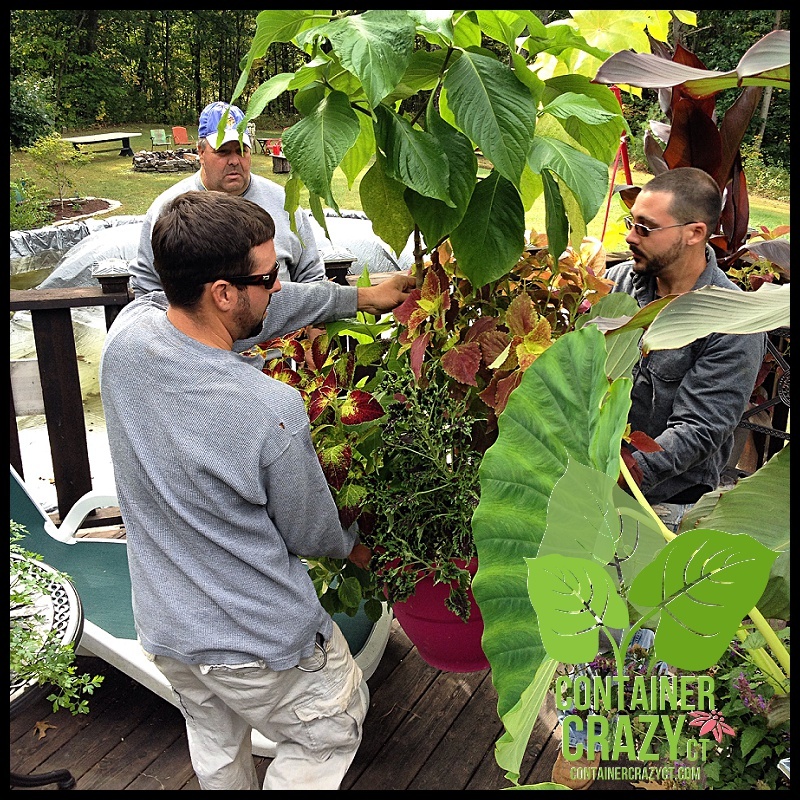 Alocasia was moved inside, see the leaves turning color – they want to stay warm. Leave the pots right where they are outside. It is colder out but not a frost situation yet. The plants will change color and look a bit off, but if you are planning to chop the foliage down to remove the underground parts from the soil for storing over the winter, then it is okay if the foliage gets a bit of cold damage. However, if you want to take it in as a house plant, I say do it now. 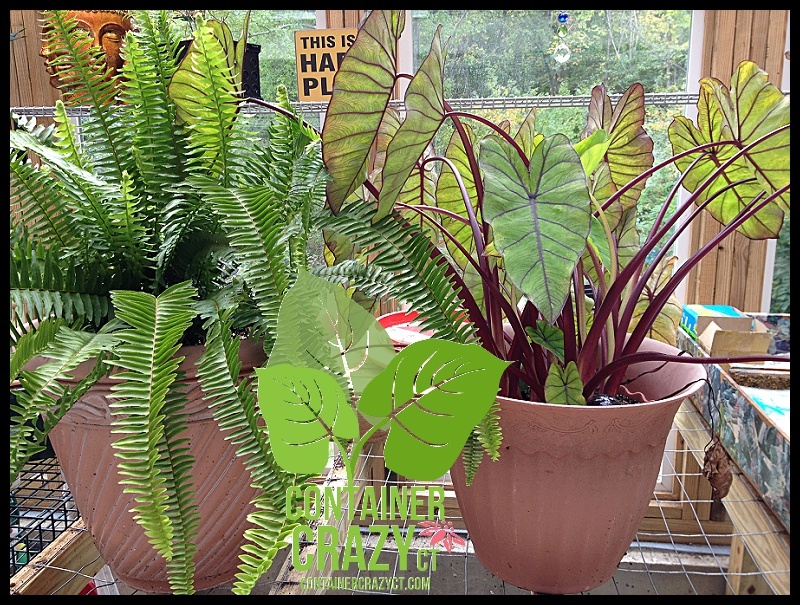 Fern and Colocasia (Elephant Ear) moved inside. 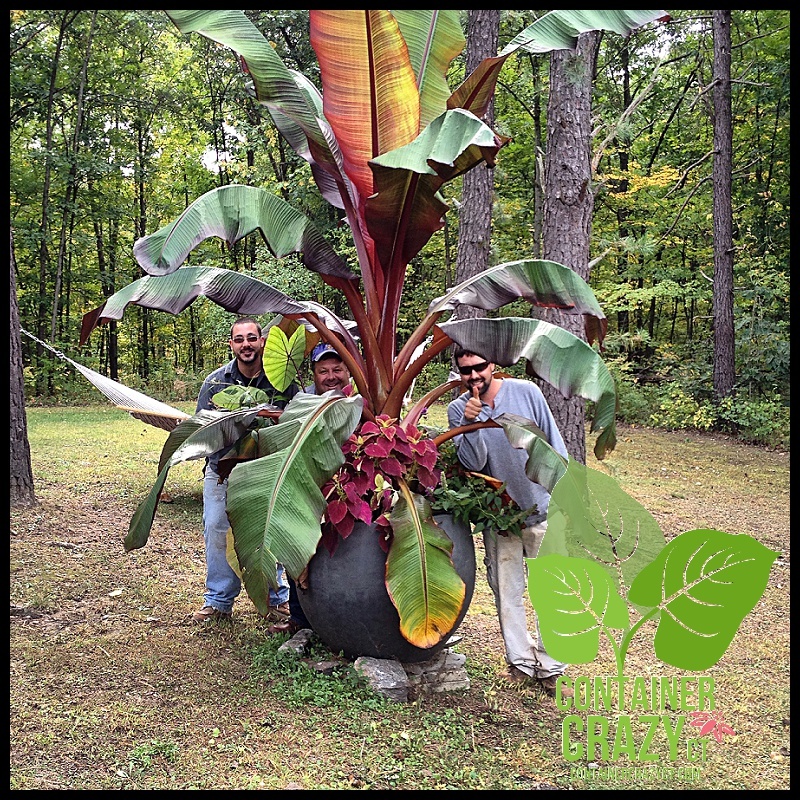 The big red banana plant (Ensete) to be part of demo day. That’s all for now. If I think of anything else later, I will add it on. If you have questions about a specific plant, just fill out this contact form below.